In 2007 I had the opportunity to volunteer in India in between two other appointments in the northern hemisphere. I stumbled across ODAM - the Organisation for Development Aid and Maintenance, based in Tamil Nadu. If any of you have looked into volunteering, you may have found that many organisation ask you to pay for the experience. At the time I was going to India I could not afford to pay (which is why I was going to volunteer), and I found ODAM did not expect you to pay any more than your board for the time you worked with them. On arrival into Madurai, being met by ODAM staff at the airport, and then being driven the two hours to our remote and isolated village, I found the staff to be generous, hospitable and incredibly welcoming. After 6 weeks, one grows to love them! ODAM take a community development perspective to their approach to poverty alleviation as they look to different ways to support the rural and remote poor. They have a multi pronged approach - using local resources to develop products that are needed locally - ie Biodeisel. Then they have been working on methods to use the bi products of biodeisel production to make soap. when the soap production methodology is refined, they hope to be able to set up local communities with their own methods of production and there for income generation. What attracted me to ODAM is their recognition that the education of girls and empowerment of women is critical for addressing poverty and disadvantage in India's rural communities. They work with local families, who as a result of their extreme poverty, have signed contracts for their daughters to work in factories and brick making fields, in the promise of a dowry. ODAM facilitate the early release of the children from these contracts and brings them into an intense education process. The concentrated education process is designed to bring the children up to the same level as other children their age. Some of this education process is funded by the Indian Government, however, ODAM has found that they need extra financial support to ensure the girls are safe and secure in their hostel accommodation, and that they receive broader education opportunities - such as sport and languages. ODAM also believes that if the girls and their families would like to continue their education past year 9, they should be supported to do so. The government does not fund the extension of their eduction past year 9. ODAM provides hostel accommodation, extra tuition and emotional support for girls who wish to continue on in their education through to vocational training or university. This is critical to ensure that the students are not distracted with family business demands, returned to the workforce or married prior to completing the education level they wish to achieve. My connection with ODAM is one that will last for a very long time. I am so excited to see some the the girls I taught English in 2007, now working or pursuing their vocational training as tailors, nurses and secretaries. I have seen how ODAM is providing the girls with opportunities their parents never had, and doors are opening so that these children, from rural, remote and extremely poor families, are having choices made available to them for their health, happiness and their future families health. I have returned to work at the school and hostel in 2009, 2013, 2015 and 2018, and each time I am touched by the passion of the staff in ODAM's programs, and I'm moved by the progress being made in their part of India. In 2013, I experienced an incredible moment while I was shopping in Madurai ( 100km from the village). While shopping for a new Indian dress, I was interrupted by 'Madam, Madam' being called out across the shop floor. The young women approached my friend and I with beaming smiles. She was one of our students in 2007 and now she was working in the city in a popular fashion department store. Seeing that our students are finding work outside their traditional roles as mothers and farm hands or road workers is just a wonderful experience! 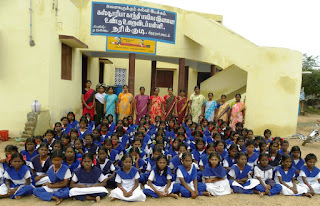 Latest News - I'm planning to go back to the school and village later this year (September 2013). My aim for this trip will be to contribute again to the teaching program, undertake some research, evaluate one of the programs and write some grant applications. Additionally, I hope to collect some stories that will contribute to my continued efforts to raise money for the school from home.